The Pentagon tests the MOAB in March. WASHINGTON (CNN) -- The United States has moved its newest -- and biggest -- conventional bomb to the Persian Gulf region, Pentagon officials said Wednesday. The officials said a single, 21,000-pound MOAB bomb has been moved to an undisclosed forward base. "I can confirm the MOAB is now in [the] theater," a Pentagon official told CNN. "But I can't comment on whether there are any plans to use it." The bomb, nicknamed the "mother of all bombs," is officially known as the Massive Ordnance Air Blast. 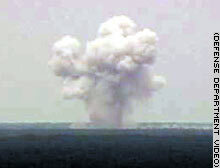 The MOAB received international attention before the war when the U.S. Air Force tested it at Eglin Air Force Base, Florida, in March. The Air Force quickly released video of the March test, which showed the bomb falling through the sky and bursting into a massive fireball upon impact. A cloud of smoke then rose hundreds of feet into the sky. At the time, the video was released in hopes of placing additional pressure on the Iraqi military, officials said. MOAB has been under development since late last year. The bomb carries 18,000 pounds of conventional explosives that have an indefinite shelf life. It replaces the Vietnam-era "Daisy Cutter," a 15,000-pound bomb with 12,600 pounds of the less-powerful GSX explosives. As conceived, the MOAB was to be used against large formations of troops and equipment or against hardened above-ground bunkers. The target set has also been expanded to include deeply buried targets. Military officials told CNN at the time of the test the MOAB was conceived mainly as a weapon employed for "psychological operations." Military officials hoped the MOAB would create such a huge blast that it would rattle Iraqi troops and pressure them into surrendering or not even fighting. Now that Iraqi troops have surrendered in large numbers, it was unclear what the possible targets might be. The MOAB is deployed on a pallet from a C-130 aircraft. It is launched initially by parachute, but as it deploys, the Inertial Navigation System and Global Positioning System take over. The bomb also has wings and grid fins for guidance.